Hi there all, I have been crazy busy and so terribly absent from my blog. Geesh…I really need to get better at all this juggling between summer, being a mom to two, having multiple clients etc. I’d love to hear from you all about what you’d like to see and read on my blog? 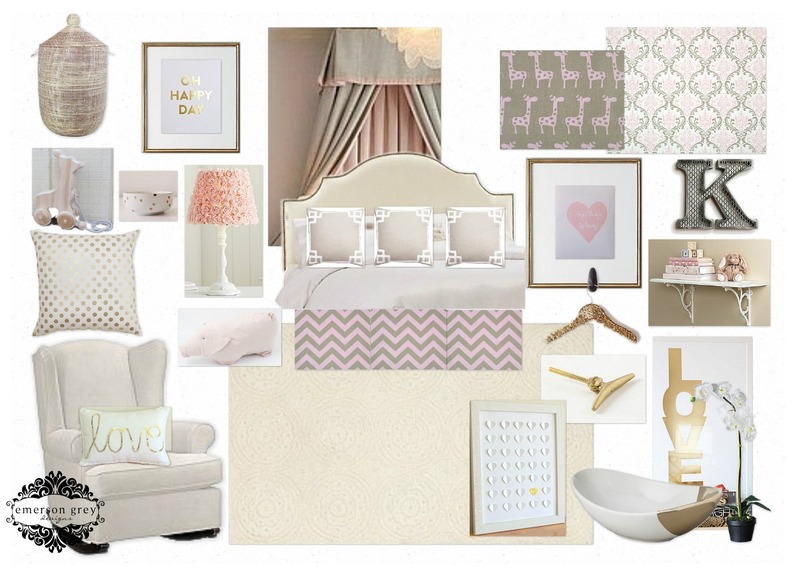 I love providing you with nursery inspiration boards, both ones done for clients, but also the ones I just mock-up. But what else would you like to see…? Don’t be shy. Thankfully, when I have these random breaks of blog silence you can find me at so many other places. Take a look and click on the icons to the right. Pinterest, facebook and instagram are great ways to stay in touch with me. I’m super active on them and I’d love for you to follow along. Now…I wanted to share with you my most recent client design for another adorable little girl who is going to be getting the most beautiful princess worthy room! I can’t wait to see it. This was another mini e-design that I completed. My client had picked out the three main fabrics, the rocker and the bed crown. I pulled the rest together and we are both so excited on how it turned out. The color scheme of pink, cream, white and touches of gold are just so pretty and calm. This is definitely one of those rooms that can grow with her for awhile, which I just love.